Say you would like to have WhatsApp on Ubuntu as a sandboxed application, but you cannot find any package for that. WhatsApp has a web page, but how to make sure that the page opens as separate application and its provider cannot track you on other pages or hack access to your login or history? Two step solution below uses Chromium browser. 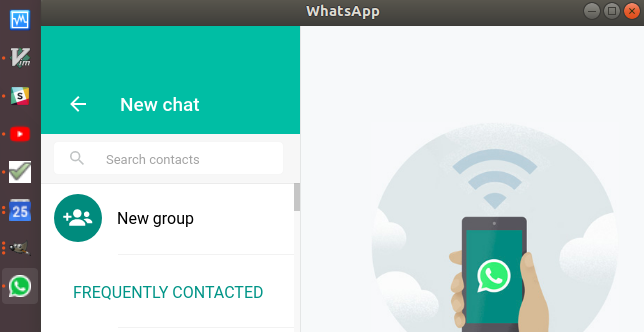 Exec=chromium-browser --class whatsapp -user-data-dir=".config/whatsapp" --app="https://web.whatsapp.com"
Note 1: You can also install the desktop file without admin rights for current user only: cp whatsapp.desktop ~/.local/share/applications/. Note 2: Do not use command above unchanged in commandline. It relies on being executed in home directory to store its profile in .config. I found no easy way to add $HOME reference into a desktop file. 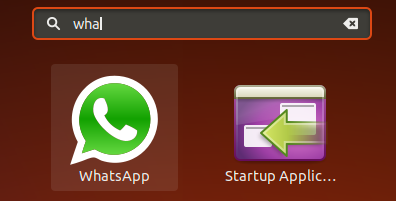 Download and uncomment the Icon line to have icon displayed in Ubuntu search (launcher). However, Chrome will override Taskbar icon with the page icon upon load. This lowers your Taskbar icon resolution, but on the other hand simplifies the process. Custom Taskbar as well as search (launcher) icons are supported on Firefox. Firefox has advantage in that it doesn’t override your custom icon in the Taskbar, however requires manual profile creation step and manual removal of address bar. Perform manual step of creating Firefox profile on first startup. Optional: Remove the tab and address bar). url: Url of the app starting with https or http. name: Name of the app used for search and commandline.